Sounds like an amazing claim. It’s a fact that’s vitally important in today’s economy with its shrinking road maintenance budgets. Industrial trucking destructively impacts all roads and particularly rural, low volume farm-to-market roads. There are few options for repair and reconstruction. All involve large quantities of new stone, even with geosynthetics and in-depth reclamation techniques. Now a proven aggregate confinement technology is being used on industrial roadways with significant success. This technology called Mechanical Concrete®, physically confines stone aggregates within a thin-walled structural cylinder. It creates a road base with a collection of open ended, waste-tire-derived, cylindrical segments filled with crushed stone, i.e. tire-derived-geo-cylinders, TDGC. This physical confinement process creates a virtually solid stone material with a minimum, lab proof tested, load supporting capacity in excess of 200 psi more than twice the truck tire loading. 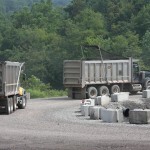 On June 20, 2011, MEPCO Mining, Morgantown, WV, reopened a gravel surface road at its Mon River dock, reconstructed with a Mechanical Concrete® base. This dock road handles 300 coal trucks per day which weigh out at between 80,000lb and 110,000lb each. Prior to its reconstruction this gravel road required approximately 2 truckloads of new crushed stone per week to keep it passable. 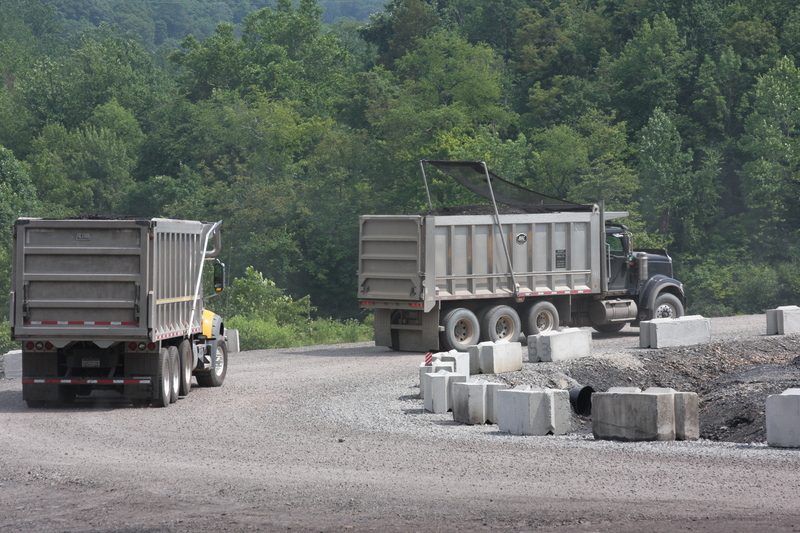 The new Mechanical Concrete® road has consistently been maintained 2 truckloads of new stone per month. This represents an over 75% reduction in maintenance costs. Stone filled tire-derived-geo-cylinders offer a consistent, strong, sustainable, economical alternative for reconstructing urban and rural roads impacted by industrial trucking loads. The river dock truck scale is a steel girder bridge with concrete abutment supports. It has concrete scale approach and exit ramps which slop away from the scale and were constructed directly on a base of a #57 stone filled, tire-derived-geo-cylinder Mechanical Concrete®. The 120 foot long entrance approach slab has 5 full depth construction joints without load transfer dowels and full depth expansion joint at the scale abutment. The 65 foot long exit ramp has 3 full depth construction joints without load transfer dowels and full depth expansion joint at the scale concrete abutment. Considering the 300 coal truck daily traffic it is notable that after over 2 years and 180,000 trucks there is no visible settlement at these joints in spite of their full depth and the rainy weather conditions of the region. This demo project conclusively shows how Mechanical Concrete® can reduce maintenance costs for all public and private road owners on all types of roads. Mechanical Concrete® saves road maintenance dollars.